Life scientists from UCLA's College of Letters and Science have discovered fundamental rules of leaf design that underlie plants' ability to produce leaves that vary enormously in size. In their mathematical design, leaves are the "perfect machines," said Lawren Sack, a professor of ecology and evolutionary biology and senior author of the research. The UCLA team discovered the mathematical relationships using "allometric analysis," which looks at how the proportions of parts of an organism change with differences in total size. This approach has been used by scientists since Galileo but had never before been applied to the interior of leaves. Reporting in the October issue of the American Journal of Botany, the biologists focused on how leaf anatomy varies across leaves of different sizes. They examined plant species from around the world, all grown on the UCLA campus. While it is easy to observe major differences in leaf surface area among species, they said, differences in leaf thickness are less obvious but equally important. "Once you start rubbing leaves between your fingers, you can feel that some leaves are floppy and thin, while others are rigid and thick," said Grace John, a UCLA doctoral student in ecology and evolutionary biology and lead author of the research. "We started with the simplest questions—but ones that had never been answered clearly—such as whether leaves that are thicker or larger in area are constructed of different sizes or types of cells." The researchers embedded pieces of leaf in plastic and cut cross-sections thinner than a single cell to observe each leaf's microscopic layout. This allowed them to test the underlying relationship between cell and tissue dimensions and leaf size across species. Leaves are made up of three basic tissues, each containing cells with particular functions: the outer layer, or epidermis; the mesophyll, which contains cells that conduct photosynthesis; and the vascular tissue, whose cells are involved in water and sugar transport. The team found that the thicker the leaf, the larger the size of the cells in all of its tissues—except in the vascular tissue. These relationships also applied to the components of the individual cells. Plant cells, unlike animal cells, are surrounded by carbohydrate-based cell walls, and the scientists discovered that the larger cells of thicker leaves are surrounded by thicker cell walls, in a strict proportionality. The team was surprised by the "extraordinary" strength of the relationships linking cell size, cell-wall thickness and leaf thickness across diverse and distantly related plant species. These relationships can be described by new, simple mathematical equations, effectively allowing scientists to predict the dimension of cells and cell walls based on the thickness of a leaf. In most cases, the relationships the team found were what is known as "isometric." "This means that if a leaf has a larger cell in one tissue, it has a larger cell in another tissue, in direct proportion, as if you blew up the leaf and all its cells using Photoshop," said Christine Scoffoni, a doctoral student at UCLA and member of the research team. By contrast, a leaf's area is unrelated to the sizes of the cells inside. This allows plants to produce leaves with a huge range of surface areas without the need for larger cells, which would be inefficient in function, the researchers said. The team hypothesized that these strong mathematical relationships arise from leaf development—the process by which leaves form on the branch, growing from a few cells that divide into many, with cells then expanding until the leaf is fully mature. Because light can penetrate only so many layers of cells, leaves cannot vary much in the number of cells arranged vertically. The expansion of individual cells and their cell walls occurs simultaneously and is reflected in the thickness of the whole leaf. On the other hand, the number of cells arranged horizontally in the leaf continues to increase as leaves expand, regardless of the size of the individual cells. 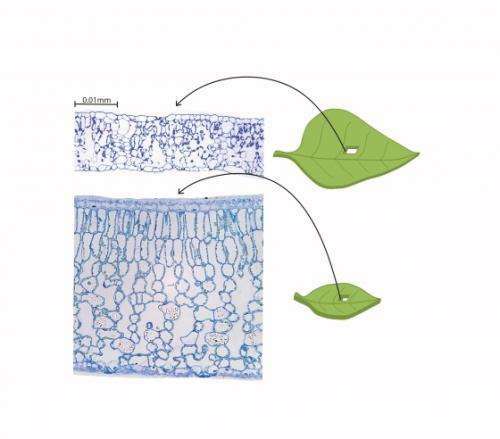 The new ability to predict the internal anatomy of leaves from their thickness can give clues to the function of the leaf, because leaf thickness affects both the overall photosynthetic rate and the lifespan, said Sack. "A minor difference in thickness tells us more about the layout inside the leaf than a much more dramatic difference in leaf area," John said. The design of the leaf provides insights into how larger structures can be constructed without losing function or stability. "Fundamental discoveries like these highlight the elegant solutions evolved by natural systems," Sack said. "Plant anatomy often has been perceived as boring. Quantitative discoveries like these prove how exciting this science can be. We need to start re-establishing skill sets in this type of fundamental science to extract practical lessons from the mysteries of nature. "There are so many properties of leaves we cannot yet imitate synthetically," he added. "Leaves are providing us with the blueprints for bigger, better things. We just have to look close enough to read them." The new allometric equations are an important step toward understanding the design of leaves on a cellular basis, John said. And because leaves are so diverse, she said, there is much to learn. In future research, the group will study species that are very closely related in an effort to uncover any evolutionary relationships between leaf design and function. "What makes the cross-sections especially exciting is the huge variation from one species to the next," John said. "Some have relatively enormous cells in certain tissues, and cell shapes vary from cylindrical to star-shaped. Each species is beautiful in its distinctiveness. All of this variation needs decoding." I do not know about plants. They are just Food & Beauty for us. There have been attempts & also a Success in creating life de novo from scratch. Unfortunately, practical aspect is lost for the present in such attempts. Now a days they can sequence microbes' DNA so easily & fast too. Why NOT look for 1 photosynthesizing & 1 Non-photosynthezing microscopic organisms that are say 90% close AND CONVERT the Later into the Former? Once they Succeed...They can move up the chain...Protozoa, Coelenterata...All the way upto Humans AT LEAST by the NEXT Millennium! Is it not nice NOT TO EAT 3 times a day? I am sure our Distant Successors will be VERY Grateful to us for the above....just as We are Very Grateful to the Car-Makers & Plane-Makers of the Past for their Inventions! It is Essential to take DNA for a Spin Very Fast. The Federal Govt. should declare like a $5M Challenge for those coming up with a Discovery such as given above. Federal Govt. should be VERY INTRUSIVE with Tax payers' funds in its hands....for the TOPMOST Inventions/Discoveries...including those of prospective Nature. There should be Scientific Committees that can Actively Solicit such Interventions........Not Congress Law Makers ....Who are JUST POLITICIANS..Many Just Vote-Getters...and No-Brainers! Several behind your Rear makes you more of a Gangster than an Intelligent One for the Society at Large. People LIKE SHEEP Vote for those with a Bigger Following that are based on VARIOUS FOOLISH CRITERIA! With the Above approach...All the Money spent on Agriculture can be saved. Weizmann Institute's Report Today --"New Stem Cells Go Back Further" indicates clearly that cells are very Malleable at those stages; So, Same Rule should apply to the Unicellular & still Lower level Organisms Too!